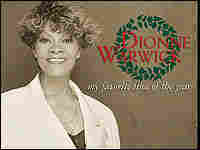 It's a Most Wonderful Time for Dionne Warwick Dionne Warwick started singing at six. She reached stardom in the 1960s, wrapping her sophisticated voice around memorable pop tunes. Now she's out with her first-ever collection of holiday music, My Favorite Time of the Year. She tells NPR's Tavis Smiley about it. Born into a gifted gospel-music family, Marie Dionne Warwick first raised her voice in song at age six. Though reared in the church, she is not a gospel singer. Her unique sound is a sophisticated combination of music forms. Indelibly tied to the songwriting combination of Burt Bacharach and Hal David -- remember "I Say a Little Prayer" or "I'll Never Fall in Love Again" -- she filled the airwaves in the 1960s and has enjoyed a diverse and sparkling career. Now she's back with her first-ever collection of holiday songs. It's called My Favorite Time of The Year, and it brings that distinctive Warwick style to time-honored holiday classics, from "Joy to the World" to "Have Yourself a Merry Little Christmas." Warwick talks about her music with NPR's Tavis Smiley, and tells why it took her 40 years to do a Christmas album.